JERUSALEM ““ By now it would seem that Israelis are accustomed to calls for boycotts of Israeli products and institutions. Many, however, may have been caught off guard this summer when those calls came from inside Israel. In two separate incidents over the past few weeks, Israelis issued a call for boycott or announced a boycott of an Israeli institution for political reasons. One protest came from the right, directed at an Israeli university with allegedly “anti-Zionist” professors on staff; one came from the left, directed at an Israeli theater in the west bank. The boycotts from within may mark a new front in Israel’s political battles. For the time being, mainstream Israeli figures are condemning both boycotts. “Culture is a bridge in society, and political disputes should be left outside cultural life and art,” Israel’s minister of culture and sport, Limor Livnat, said in response to the theater boycott. The latest boycott call came after several Israeli theater companies announced plans to stage productions at a new theater in Ariel, a Jewish city of 20,000 in the west bank. 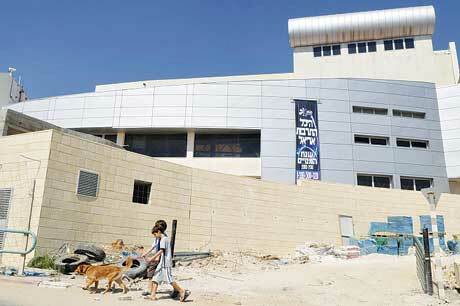 The $10 million cultural center in Ariel, which was built partly with government funding, is scheduled to open Nov. 8. It will be the first major theater in a Jewish settlement, most of which are smaller bedroom communities. As the theater schedule came to light, nearly 60 Israeli theater professionals signed a petition last weekend saying they would refuse to perform at the new venue or in any west bank settlement. On Tuesday, about 150 academics and authors signed a letter supporting the petition. “We will not take part in any kind of cultural activity beyond the Green Line, take part in discussions and seminars, or lecture in any kind of academic setting in these settlements,” the letter said. “My contract with the theater says explicitly that I am obligated to perform within the State of Israel – and Ariel is not part of the state,” director and actor Oded Kotler, a boycott petition signer, told Army Radio. The Ariel boycott call follows on the heels of a call to boycott Ben-Gurion University issued by the campus group Im Tirtzu, which says that professors in the university’s department of politics and government harbor anti-Zionist biases and are silencing students’ Zionist viewpoints. University President Rivka Carmi condemned Gordon’s call but has not dismissed the department chief. University spokesman Amir Rozenblit said that the university complies with the quality and content requirements of the Israeli Council for Higher Education, and that it hires faculty members based solely on their professional and academic qualifications, not political opinions. Im Tirtzu’s threat to approach Ben-Gurion University donors for failing to dismiss its “anti-Zionist” staff prompted some Im Tirtzu supporters in the United States to rethink their support for the organization. Meanwhile, Ben-Gurion University condemned the boycott call by Im Tirtzu. “Just as university president Prof. Rivka Carmi harshly condemned those who called for an international boycott of Israel, so too the university denounces any group that calls for a boycott of any Israeli university based on the opinions of its academic faculty members,” Rozenblit said. This week, the Israeli media were buzzing with opinion-makers debating the Ariel affair. In Haaretz, columnist Akiva Eldar suggested that artists who oppose Israel’s presence in the west bank use the opportunity to stage performances for settlers that would prompt them to think twice about the occupation. Another of the daily’s columnists, Gideon Levy, countered that Israeli theaters would be boycotted internationally if they forced actors to perform in the west bank. Many voiced outrage that government funding goes to the theaters whose members are now calling for the boycott. On Sunday, the Israeli prime minister weighed in. Netanyahu, Livnat, and other government ministers have threatened to sanction theaters that refuse to perform in west bank venues. The Habima, Khan, Beersheba, and Cameri theaters are all scheduled to stage productions in Ariel. The theaters each received about $2.5 million to $3 million from the ministry of culture and sport, according to an official in Livnat’s office. The ministry was not involved in funding the theater in Ariel, which is located about 10 miles inside the west bank and is the fifth-largest Jewish settlement in the territory. The theaters issued a collective statement saying that the scheduled Ariel productions will go on, but that they would “respect the political opinions of their actors.” The theaters are consulting with their legal advisers on how to proceed with artists who refuse to perform in the west bank, a culture ministry official told JTA.